Let’s get inspired to make beautiful Easter Eggs together this year. Here are three ideas filled with Flower Power! Fun! Fun! Fun! These are made using small leaves, grasses and flowers you can collect from your yard. Start by collecting a few botanical specimens. Attach one to each egg, wrap the egg in a nylon and place in dye bath. Remove nylon and leaf when finished. For more detailed instructions, please see Martha Stewart Botanical Eggs. And Wa-lah! Beautiful botanical eggs made by a beautiful little gal. Looking for a more natural way to dye your eggs? No problem. 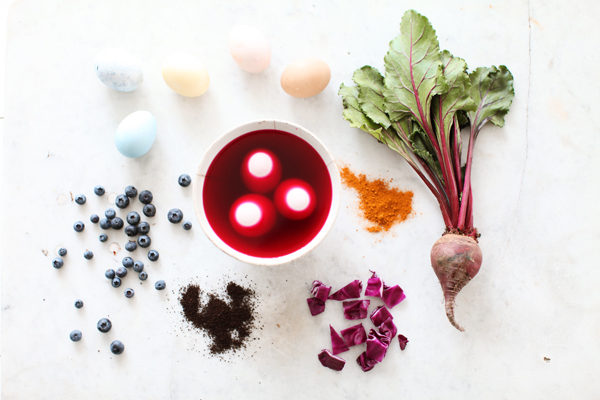 You can create all-natural dye recipes made from household ingredients to create Easter eggs in beautifully subdued shades. 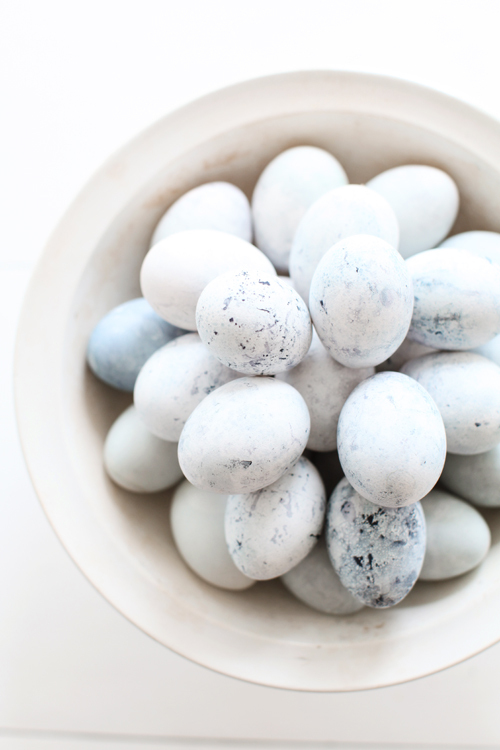 These lavender colored speckled eggs were a product of mixing grape juice and vinegar together, and left overnight. For the recipes please visit Better Homes and Garden’s website. Another idea is to use egg shells as your vessel. This is an extremely affordable….yet totally elegant way to add Easter Eggs to your table setting. The eggs are so small, that is just takes a few little stems of flowers to fill them…and you can most likely find a few small little spring bloomers in or around your yard. Martha Stewart can tell you more about making flower arrangements in eggshells here. 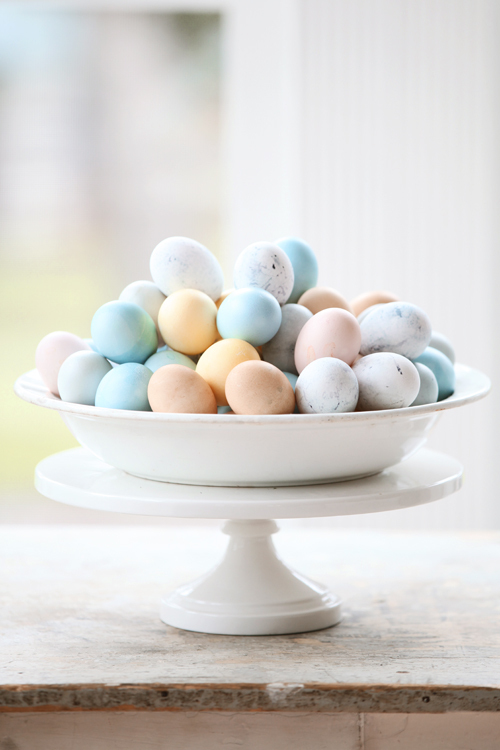 For a more vintage look…try using a ceramic egg holder, like this one from Anthropologie. Then just add a few cleaned egg shells filled with water and a few herb snippings from the yard. Simple and cute! And for the more earthy type…you can use your egg shells to start seedlings. First rinse out the eggshells so they are clean and put a small hole in the bottom of each half for drainage. Then place the eggshell halves into an egg carton, add some potting soil to each eggshell and place a seed inside. When the seeds begin to sprout, you can plant the sprouts and eggshell together directly into the ground outside (crack the eggshell before placing into the ground so that the roots can spread) where the shell will biodegrade and give calcium to the new plant. So may the power of flowers bring inspiration to your easter eggs this year! Enjoy!